The jersey number 29 is now retired, but the legacy of Stan Jakubowski's mastery of the Miami pitching mound lives on in the record books as one of the Hurricanes all time greats. 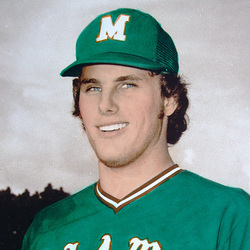 The fiery righthander played a key role in Miami's first ever appearance in the College World Series, a second place finish in 1974. As a 19 year old sophomore, Jakubowski hurled a nine hit complete game win over Harvard in the opening round of that tournament, and was later named to the CWS All-Tournament Team. He finished that memorable season with a 16-3 record and a sparkling 1.46 ERA. Over the course of his four year UM career, he set Hurricane records for complete games (27), innings pitched (432), and earned run average (1.81). He also compiled a career record of 40 wins against 14 losses, which ranked third behind Neal Heaton and Dan Davies in the career victory category. "Stan the Man", as he was known to Hurricanes fans, was a member of Coach Ron Fraser's 1973 World Amateur championship team. He went on to star in the Pittsburgh Pirates and Texas Rangers organizations. "Stan the Man" will always be remembered as one of the greatest pitchers to ever wear the Orange, Green and White.